“Dear Evan Hansen” opened on Broadway Sunday with the same main cast as the Off Broadway production reviewed last spring. The hashtag generation finally has its own hit musical. Not since 1996 when “Rent” opened Off Broadway have post-adolescents had a show to call their own. “Spring Awakening” was a mere blip in 2006, using 19th-century characters to express contemporary sexual angst. But “Dear Evan Hansen,” which opened Sunday at Second Stage’s Tony Kiser Theatre, is the real 21st-century deal, and could turn into as big a success with teenagers and twentysomethings. No, “Dear Evan Hansen” is not an after-school special, even though it’s about high school students. Steven Levenson’s extraordinary book looks at the nature of community and fame in a world where people communicate not face to face but over the Internet. The story he tells should be experienced in the theater and not told in a review. 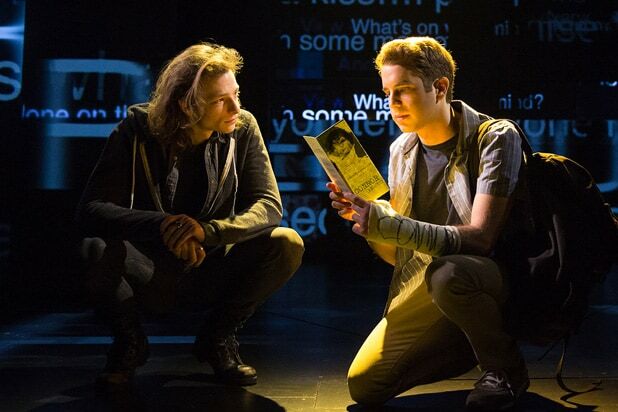 To keep it short, Evan Hansen (Ben Platt) manufactures a friendship with a high school classmate named Connor Murphy who’s just committed suicide (Mike Faist). Soon, emails that were never sent between the two boys are posted on the Internet, and Evan and Connor are both turned into celebrities. There are a couple of interesting twists. No one, especially Connor’s sister (Laura Dreyfuss), liked the boy when he was alive. Now he’s a saint. No one spoke to Evan at school before Connor’s death. Now he’s everyone’s best friend. Levenson artfully skewers those massive, indulgent street-side memorials where people mourn someone they never knew just because the dead person’s famous. In “Dear Evan Hansen,” Connor’s mother (Jennifer Laura Thompson) thanks Evan for giving her her son back. Actually, Evan creates someone Mrs. Murphy never met. In a theater season of magnificent sets, from “Lazarus” and “A View From the Bridge” to “American Psycho” and “Shuffle Along,” David Korins’ scenic design for “Dear Evan Hansen” is one of the most arresting. Together with Levenson and director Michael Greif, he makes a show about computers and the Internet anything but static. There are plenty of typed words and Facebook-like images (projections by Peter Nigrini) that keep appearing on a collage of sliding screens, but “Dear Evan Hansen” never degenerates into the kind of production (think Patrick Marber’s “Closer”) where the audience sits reading email exchanges rather than watching the actors. Greif also showcases three supporting performances. In his few brief appearances, Faist gives Connor true enigmatic status. As his sister and Evan’s love interest, Dreyfuss takes a Alicia Silverstone cliché and rids it of any calculated cuteness. Most impressive is Rachel Bay Jones as Evan’s mother, who expresses love even when she’s telling her son how to order out for his dinner because she’s working late or taking a night class. In the title role, Platt gives the kind of performance that wins awards. This is probably a minority opinion, but he would probably be even more effective if he cut that performance in half. When Evan introduces himself in his bedroom, on the computer, he is so twitchy and blinks so much and runs together his words, which are often interrupted with a nervous giggle, that you might think it’s a musical about autism or Asperger’s syndrome. On the contrary, he’s just anxiety-ridden and taking meds — until he stops. Evan needs to be made sympathetic even though he is a chronic liar. But Platt begs for our pity. 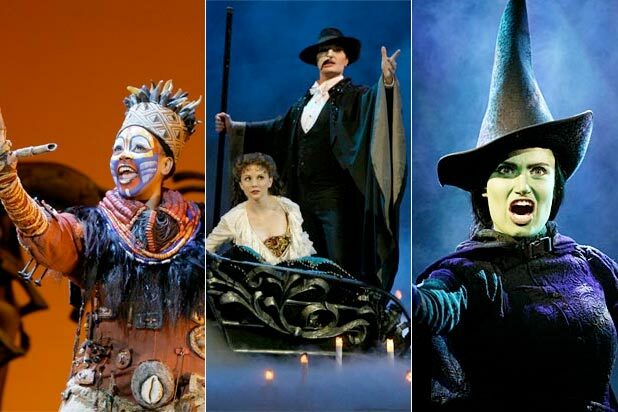 Has any lead, male or female, in a musical cried this much on stage? That’s the audience’s job, not the actor’s. Also, in addition to all the twitchiness, Platt has a tick that might be a character trait but is disturbing for another reason. When he isn’t scream-singing, he resorts to a falsetto on notes near or above the staff. Composer-lyricists Benj Pasek and Justin Paul have written intelligent lyrics that are sometimes more commentary than poetry. Their music features easy, uncomplicated melodies. The score is best when Alex Lacamoire’s orchestrations support the vocal line with only a piano or a few string instruments. Invariably, however, a simple tune is inflated to deliver the big moment with too much percussion and a bouncy syncopation used by every other modern musical.